This is a great slot to play to put you into the Christmas spirit. The Elf Wars is a 5 Reel, 50 line video slot that offer players a shot at winning a jackpot. 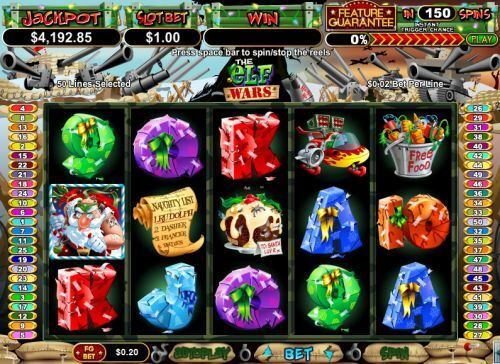 The Elf Wars uses Realtime Gaming Software to ensure a smooth and quick slot experience. Also available to be won is a great Progressive Jackpot. Incredible set of betting limits available here. Players can wager: $0.10, $0.20, $0.30, $0.40, $0.50, $0.60, $0.70, $0.80, $0.90, $1.00, $2.50, $5.00, $10.00, $25.00 and $50.00. Players must bet on all 50 lines every spin. As with all Christmas themed slots there are symbols that relate to Christmas. Some of the symbols include: Good and Bad Elves, Santa Claus, Toys, a Snowman, Rudolph and much more. Classy Coin Casino offers new players a $25.00 no deposit bonus just for signing up. So be sure to take advantage of this great freebie. Players can manually stop the Reels to have more control of each spin. There is also an autoplay feature, allowing you to set back and watch the winnings pile up. You can play the Elf Wars for free at Classy Coin Casino. Once you arrive at Classy Coin Casino you will first have to decide if you want to play using their browser based Casino or to download their Casino. As always with ay online Casino, it is better to download the Casino for many reasons. You will have a better Slots experience when you download thanks to the improved software, ease of access and overall faster gaming. Although both options are decent the downloaded version is far superior. After you have decided on which of their Casinos you are going to use, your next step is to register which is free, easy and quick. After you have completed signing up you will be in the main lobby of Classy Coin. Along the top of the games list you will see all the games broken down into categories and you will be choosing the Slots option. This is a solid choice when you’re looking to play a Christmas themed slot game. Not only does it look and sound great but it also runs flawlessly which makes for a much better Slots experience when there isn’t any lag or pauses. This game also has so many bonus features they just make an already good game that much better. 2 or more Good Elves or 2 or More Bad Elves will give you a free spin. If during that free spin you are able to land 3 or more Good Elves or 3 or more Bad Elves you will trigger a bonus game. For the Good Elves you will trigger the Santa Strikes Back or the Jackpot Spins Good. For the Bad Elves you will trigger the Rudolph’s Revenge or Rudolph’s Rampage. In Santa Strikes Back the player is awarded 7 free spins with an initial multiplier of one. During the 7 free spins every Santa, Good Elves or North Pole symbol earn you a Candy Cane. Get 5 candy canes then increase your multiplier and get 7 more free spins. In Jackpot Spins Good a 6 section wheel comes up and the wheel will spin 3 times. 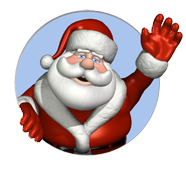 Each spin gives the user a chance at the Progressive Jackpot, the Santa Strikes Back Bonus game or up to 100X Slot Bet. In Rudolph’s Revenge the player is awarded 7 free games. Prizes during the game are multiplied by 2 plus the number of Rudolph’s on the screen. Bad Elves also act as a Rudolph. Rudolph’s Revenge is a bonus game where Santa’s Toy Factory has been destroyed and it’s up to you the player to find the 3 missing elves from the 8 available locations. If you find an Elf holding a Red Present, scattered Bad Elves act as a Rudolph during free games. Elf holding Blue present then all prizes are quadrupled during free games. Elf with a green present then Rudolph is expanded on reel 3 during all free games.